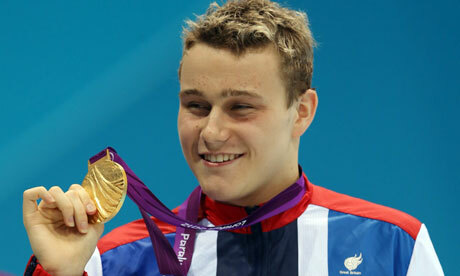 Teenager Ollie Hynd produced a brilliant swim to win gold in the SM8 200m individual medley. Hynd finished in 2:24.63, a full two seconds clear of China's Wang Jiachao in second place, while brother Sam came just outside the medals in fourth. Afterwards, Ollie told Channel 4: "I can't believe it - it's amazing. Breaststroke is my weakest stroke and I held my own in a field of people really good at breaststroke. "I didn't want to believe it at first - I thought 'That can't be right' - but I'm Paralympic champion." Sam added: "I'm really proud [of my brother] - I don't know what to say!" Rob Welbourn grabbed GB's second swimming medal of the day when he won bronze in the S10 400m freestyle. The 25-year-old Welshman said: "I'm over the moon with that. To come away with a medal from a home Games - you can't ask any more." Hannah Russell also finished third behind Natali Pronina in the S12 100m backstroke and there was more good news in the SB6 100m breaststroke final, where Charlotte Henshaw and Liz Johnson grabbed silver and bronze for ParalympicsGB. Henshaw, who finished just 3/100ths of a second behind 14-year old champion Viktoriia Satsova of the Ukraine, insisted: "I'm so pleased with a silver medal...just to get on the podium again." The 25-year-old, who suffered the agony of finishing fourth in Beijing, added: "I know what it's like to finish just outside the medals and I'm so glad that didn't happen here. I can walk away with my head held high. "Maybe in a couple of days when I watch it back I'll think I could have done this, that or the other, but right now I can't express how happy I am to have medalled at home." Johnson, who has previously won gold and silver at the Paralympics, said: "I've never got a bronze so now I've got the full set." Lousie Watkin rounded off a great night for the hosts when she grabbed silver in the S9 50m 'splash and dash', finishing a whisker behind China's Lin Ping. Watkin, who set a new British record of 29.21 secs, said: "I just put my head down and went for it. I got bronze in Beijing, so to come away with silver is amazing." There was disappointment for Jim 'The Swim' Anderson who failed to make it 18 Paralympic medals as he finished fourth in the 50m S2 backstroke.